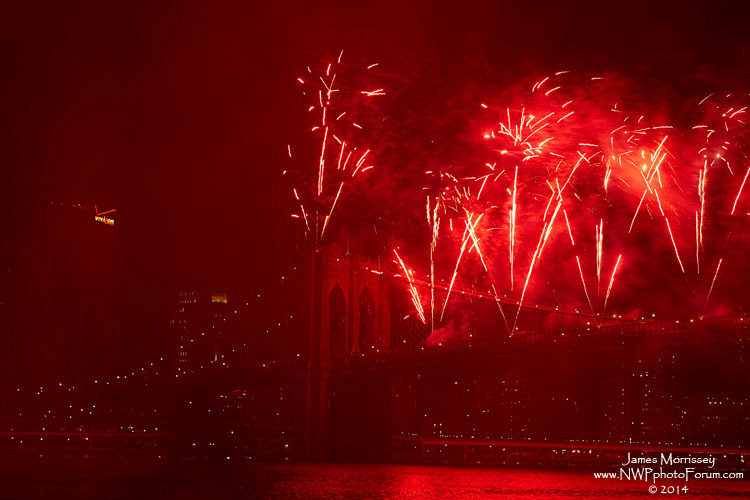 James Morrissey shares his techniques for photographing fireworks. I love fireworks. I guess most of us do. What says human nature more than explosions??? LOL, come on, it is cool to watch things explode. 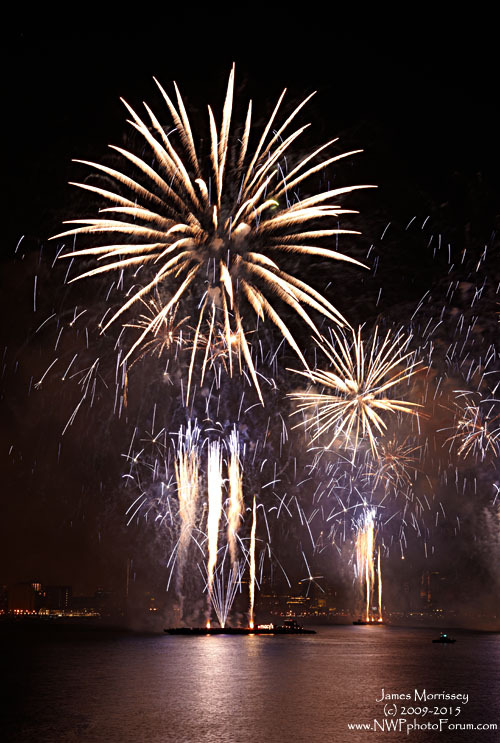 The use of fireworks has been documented going back over a thousand years. In fact, the Chinese have their use documented to about 1040 AD...long before it became ubiquitous here. 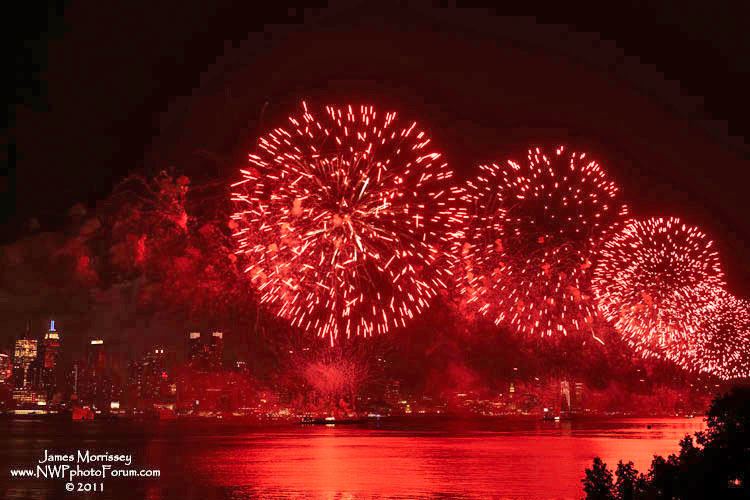 For those of us who live in the USA, Fireworks have become synonymous with Independence Day (The Fourth of July). 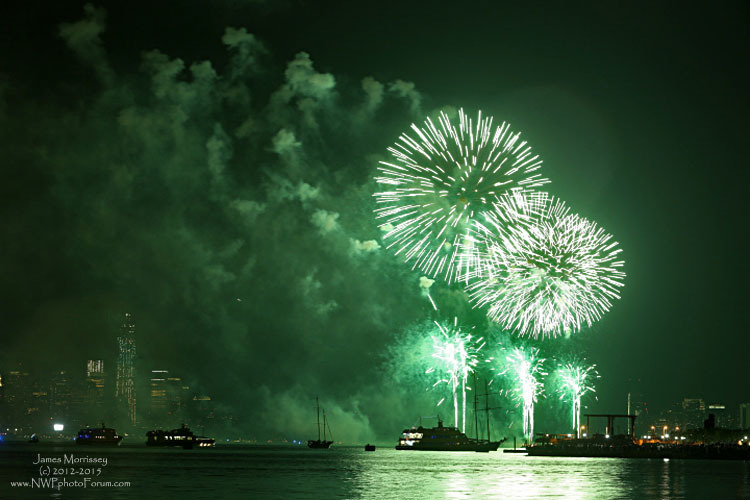 However, fireworks displays have been also used for a variety of other holidays, including New Years Day, Memorial Day and Labor Day - not to exclude the countless holidays celebrated in other countries. 1. Put Camera on Tripod and create your composition. LOL, this sounds easy, but it is really the difficult part. My feeling is that a lot of folks get caught up in the moment and bounce their cameras about trying to get the fireworks perfectly. In my opinion, this is not the best way of doing things. I try to develop a composition and then fire when the fireworks are within the frame I have already created. I do the same thing when I photograph my puffins - i.e. I stake out an area for my composition and I let the puffins come to me. It seems to work. 2. Settings - it is all about the settings. The most frustrating question that I get asked (after 'how much was your camera') is - "What settings should I use?" It is funny as obviously folks are reading this because they would like to know how to get the settings right...and I am very hesitant to go there because obviously, settings need to be determined based upon conditions in the field. i.e. one size does NOT fit all. With that caveat, I feel like I have done this enough to have some ballpark figures. For example, I have found in my compositions that I like shutter speeds between a half a second and a second. This is not categorical, some are slightly faster, some are slightly slower. I find that this is what it takes to provide that toffee like look that I want in my composition. For aperture, I generally try to shoot in the sweet spot of the lens - usually 1 to 2 stops below its maximum aperture. For example, on my Canon 28-70 F2.8L, I like to shoot between F5.6 and F8. Please note that aperture, even more than shutter speed, is going to be composition dependent. 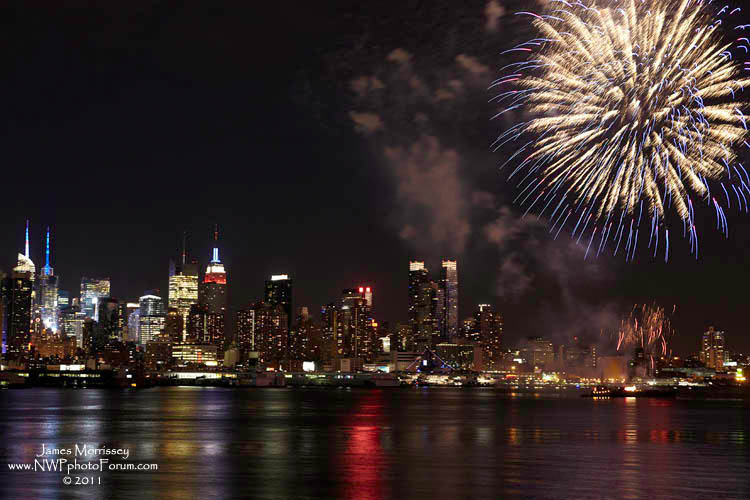 In most of my fireworks photographs, I am shooting the city skyline at close to infinity as my backdrop to the photographs. For ISO, I seem to be shooting ISOs 200-400, to insure that I have enough background light to capture my NYC Cityscape composition. Again, this will obviously be situation dependent. 3. Place your shutter release on your camera. Alternately, you can use a 2 second delay on your camera...but that gets trickier in terms of how you have to count when the fireworks are exploding. The last thing you want to be doing is jostling your camera and getting blurry compositions. The other thing you might want to do is set your mirror lock, though I have not typically had much of an issue with vibration at the longer shutter settings. There you go - it is all done. 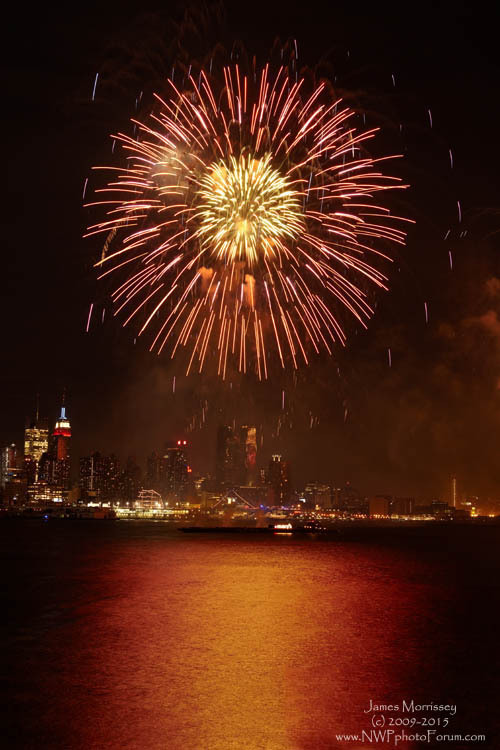 After that it is all timing and minor alterations of shutter speed, aperture and ISO to make sure that you get compositions that you are excited about - long after the celebration is over. The last shot is my favorite fireworks photo I have taken. It was shot a few years back when my friend Jeff Caplan had his awesome apartment in West New York - perfectly located for photographing the skyline. Just a reminder that the photographs and material in this article are copyrighted 2015, James Morrissey and the Nature, Wildlife and Pet Photography Forum. If you like the photos, please share the link.